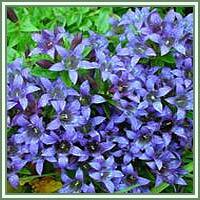 Habitat: Cross Gentian is native Europe and West Asia. It can be found on dry alpine meadows, woods, rocks and banks. 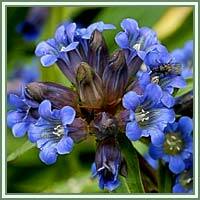 Description: Cross Gentian is a perennial, flowering plant. Leaves are organized in a dense rosette, dark green and lanceolate. They grow in an intersecting formation on green-purple stems. Flowers are small and campanulate with an intense, blue-violet color. Cross Gentian is in flower from July to September. Medicinal use: Cross Gentian root is considered to be anthelmintic, anti-inflammatory, antiseptic, bitter tonic, cholagogue, emmenagogue, febrifuge, and stomachic. It is generally used in cases of exhaustion from chronic diseases and can be very helpful in cases of weaknesses of the digestive system and lack of appetite. It also stimulates the liver and gall bladder. Cross Gentian root has also shown to be very beneficial in treatment of liver disorders, indigestion, gastric infections and anorexia. Safety: Patients with gastric or duodenal ulcers should not use Cross Gentian. Always consult your doctor/herbalist before consumption of any herb.